Climate change is a global problem, but the problem begins locally. Cities consume 75% of the world's energy and emit 80% of the world's greenhouse gases. Changing the way we build and operate our cities can have major effects on greenhouse gas emissions. Fortunately, communities across the U.S. are responding to the climate change problem by making plans that assess their contribution to greenhouse gas emissions and specify actions they will take to reduce these emissions. 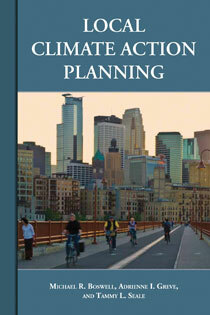 This is the first book designed to help planners, municipal staff and officials, citizens and others working at local levels to develop Climate Action Plans. CAPs are strategic plans that establish policies and programs for mitigating a community's greenhouse gas (GHGs) emissions. They typically focus on transportation, energy use, and solid waste, and often differentiate between community-wide actions and municipal agency actions. CAPs are usually based on GHG emissions inventories, which indentify the sources of emissions from the community and quantify the amounts. Additionally, many CAPs include a section addressing adaptation-how the community will respond to the impacts of climate change on the community, such as increased flooding, extended drought, or sea level rise. With examples drawn from actual plans, Local Climate Action Planning guides preparers of CAPs through the entire plan development process, identifying the key considerations and choices that must be made in order to assure that a plan is both workable and effective. "Local Climate Action Planning is a smart playbook that will prove invaluable to local governments looking to slash their greenhouse gas emissions as they reap the benefits of saving energy and money. It guides readers through clear strategies and action steps, and distills lessons from the nation's most innovative cities and counties." "Boswell et al. provide an approachable and comprehensive guide to the complex process of climate action planning. Local Climate Action Planning should be a first stop for any local government interested in addressing climate change." "Boswell, Greve, and Seale have produced the most comprehensive book on the state of the art, science, and practice of local climate action planning, grounded by the best compilation and synthesis to-date of U.S. community experience and their own applied research. This important book issues a call to action because of the critical role communities must play in managing climate change and its consequences." John Randolph, author of "Environmental Land Use Planning and Management"